A lot of the time, people aren’t able to tell the difference between when they simply love someone platonically and when they’re in love with someone. This can lead to a lot of confusion to both parties. Thankfully, there are some important differences that can help everyone figure out what they’re feeling: whether it’s just love, or whether they’ve fallen in love. 1. LOVING SOMEONE IS A CHOICE. Being in love with someone is largely involuntary. When you love someone, you make the conscious effort to continue loving them – like your family that you don’t always get along with, or your best friend from grade school that you argue with as much as you get along. Those are the kinds of people that you make the choice to keep loving. When you fall in love, you don’t really get a choice in the matter. We fall in love with people we don’t expect to all the time, because falling in love isn’t a choice. 2. BEING IN LOVE MEANS PUTTING THEM FIRST. When you love someone, you want them to do well and wish them the best. However, when you’re in love with someone, it means doing everything in your power to help them succeed. You put them first and help them reach their goals. This usually balances out, because if they’re in love with you, too, then they’re doing the same thing for you. “… the only way to love is to be less egocentric – to put the needs and well-being of others ahead of your own. When you’re willing to put the happiness of another ahead of your own, you are taking the part in the phenomenon we call love,” adds Hudson. You’re prepared to make sacrifices for one another in a way that you wouldn’t do for your best friend or someone you simply feel love for. 3. BEING IN LOVE IS FOREVER. We love many different people in our lives, and usually that love tends to fade. We love our best friends from college, but as the years change we may only remember them fondly. “Falling in love may not necessarily last long since it is usually based on infatuation, lust or obsessing over the other party,” adds Sogunle. Therefore, love is a thing that can fade – but being in love is forever. Even if those people aren’t in our lives anymore, we can still conjure up those feelings of love for them. When we’re in love with someone, an argument doesn’t make those feelings disappear. We will love them for the rest of our lives. 4. BEING IN LOVE MEANS LETTING THEM BE WHERE THEY ARE HAPPY. When you love someone, you want them around all the time. You feel good about having them with you, and you don’t ever want to say goodbye. However, when you’re in love with someone, it means you know when to let them go and be where they’re most happy. You’re ready to make the sacrifice of not having them around if it means that they’re going to be somewhere that they’re safe, healthy and happy. “When you truly love someone, in a clean, unattached way, there is an overwhelming sense of wanting the absolute best for them. 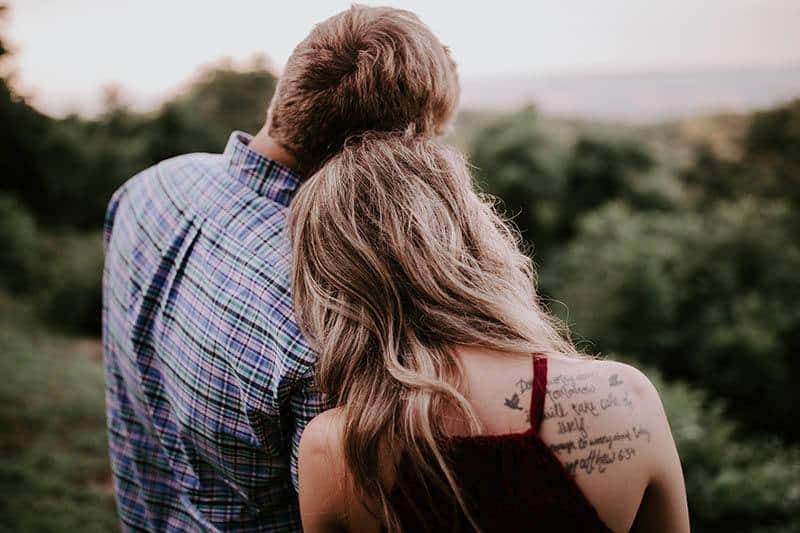 True love is wanting the absolute best for someone, even if what is best for them is to not be in a relationship with you,” says relationship coach Jordan Gray. Having a happy, balanced life means that someone you’re in love with has to spend time away from you – and you know and accept that. 5. BEING IN LOVE IS STEADY, NOT A RUSH. When you love someone it’s often quick and exciting, with a rush of emotions that knock you off your feet. You get all those good feelings all at once and eventually, they start to fade. “These quick burn relationships are the ‘kindling’ relationships. They light ablaze quickly, and then burn off into short-lived ashes in a metaphorical matter of minutes,” adds Gray. But when you’re in love with someone, those feelings don’t just come all at once and peter out. Instead, being in love with someone means that your emotions will be there constantly. Rather than having emotions that will hae incredible highs and terrible lows, you will feel a steady stream of love that never fades. 6. BEING IN LOVE IS ABOUT PARTNERSHIP. When you love someone, it’s often about how they make you feel, and feeling entitled to those emotions. But when you are in love with someone, it’s the opposite. When you’re in love with someone, those emotions are all about how you make them feel and coming together to form a partnership. Neither of you owns the other, but you are your own people and want to build a life and partnership together. “Becoming partners is a process. It’s a combination of growing as a couple, and growing as a human being on your own. It’s the reality of true friendship. It’s more than the fun parts of love. A partner means compromise. It means trudging through the muck of life knowing someone really has your back,” says Lexi Herrick, founder of HerTrack.com. Being in love and loving someone can feel the same, and you’re allowing yourself to simply focus on how good those feelings are. Loving people and being in love both have their own places in our relationships and lives. Knowing the difference between being in love and simply loving someone can help with a lot of relationships and make navigating them easier.